No, DON'T LOOK! WE'RE NOT WORTHY! 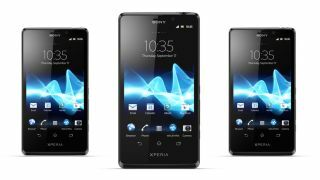 Sony Mobile sales chief Dennis van Schie has said that Sony will soon be releasing a handset to directly compete with the iPhone 5 and Samsung Galaxy S3. Speaking to the Financial Times Deutschland, van Schie openly acknowledged that nothing in the Japanese firm's current lineup of phones could stand up to the likes of Apple and Samsung's flagship devices. He told the German newspaper, "We will create, in the near future, a flagship model that can compete with Apple's iPhone and Samsung's Galaxy S3". A spokesperson for Sony confirmed that the contender would appear at CES and the Mobile World Congress in spring 2013. Although this is great news for the Sony faithful, it may be the company should instead turn its attention to the next generation of smartphones, rather than trying to play catch-up. It's already been beaten to the play by a long way, and if conjecture is anything to go by, both Apple and Samsung will be releasing the next incarnations of their bestselling smartphones next year, instantly casting a shadow over Sony's contender. There have even been whispers that Apple's iPhone 5S could start going into production as early as next month, which already spells bad news for van Schie and his team. Such comments are unlikely to sit well with owners of the recently-released Xperia T 'Bond Phone', which the Japanese firm has been touting as a handset worthy of consideration by today's smartphone buyers. Sony is essentially trying to feel its way in the mobile space as a new brand, and despite raising fortunes since losing the Ericsson brand admissions like these, while honest, will do little to convince consumers it's a decent alternative.